a live music night showcasing some of the most exciting up-and-coming artists in Aberdeen. Plentiful supply of fresh sounds and good vibes guaranteed. We have four excellent acts on the lineup, and an open stage afterwards, open to all kinds of performance (whether it's singing, reciting poetry, freestyle rap or live knitting). 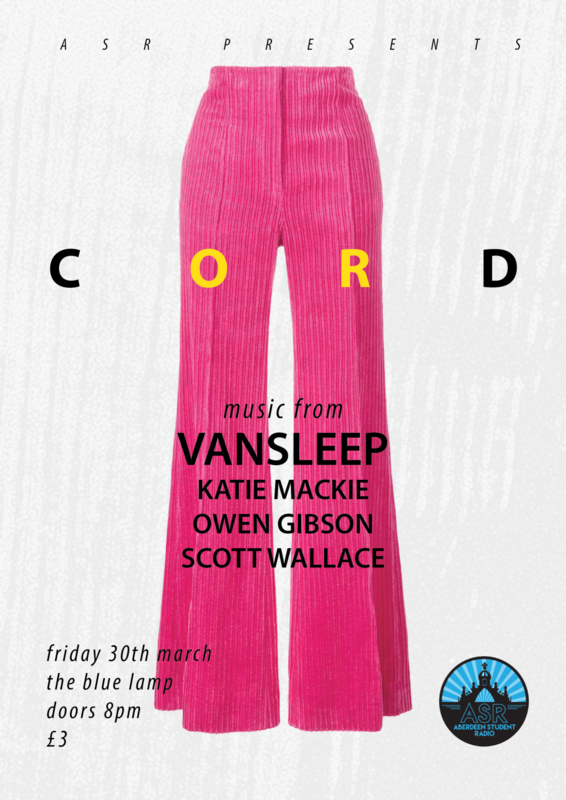 ~~~~~~~~~~~~~ 20:15 - 20:45 Scott Wallace 20:50 - 21:30 Katie Mackie 21:35 - 22:05 Owen Gibson 22:15 - 23:00 Vansleep 23:00 - 24:00 OPEN STAGE! ~~~~~~~~~~~~~ For the open stage part, you can either message us on the event or the Aberdeen Student Radio page, or you can sign up on the door. TICKETS ON THE DOOR: £3, or £1 for open stage performers and those who are ready to sport some corduroy attire! (All proceeds go towards bettering our radio and organising more events like this, supporting live music in our city).